Ohio Archives - Solar Love! Leading US solar manufacturer First Solar published its first-quarter earnings report late last month, depicting a strong start to the year with increased sales of $567 million and the commencement of Series 6 module production in April which, in turn, led to the company’s announcement of a new solar manufacturing plant in Perrysburg, Ohio. First Solar announced its first-quarter earnings to the world on April 26 at the same time as it announced plans to build a new 1.2 gigawatt (GW) solar module manufacturing facility in Perrysburg, Ohio, which is expected to create 500 jobs and will focus on producing the company’s Series 6 thin film photovoltaic module — and which was heralded earlier in the year by company CEO Mark Widmar. The news is unsurprising given US President Donald Trump’s January decision to impose a 30% tariff on all imported solar cells and modules, refocusing solar manufacturers wanting to do business in the United States and incentivizing local manufacturing. 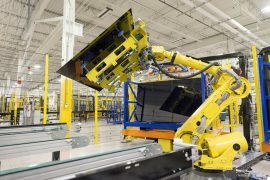 While the new solar tariff is definitely playing its part in First Solar’s decision — and the decisions of other companies, such as JinkoSolar’s newly announced Florida manufacturing facility and SunPower’s decision to acquire SolarWorld Americas’ US-based operations — it was solidified in the success of its new Series 6 solar product. Year-to-date bookings for Series 6 modules has already reached 3.3 GW and the company also began shipping Series 6 modules in the first quarter. “Our first quarter earnings and continued bookings momentum provide a positive start to the year,” said Mark Widmar. “Our earnings for the quarter were supported by the sale of both domestic and international projects, combined with efficient management of core operating expenses. Customer demand for our Series 6 product continues to be strong as evidenced by our year-to-date net bookings of 3.3GWDC. For the first quarter, First Solar reported earnings of $567 million, up $228 million on the previous quarter but well down on the spectacular $892 million reported in the first quarter of 2017. The increase in first-quarter sales was due primarily to the sale of international projects in India and Japan, as well as the sale of the company’s Rosamond project. Earnings per share for the first quarter (on a GAAP basis) amounted to $0.78 compared to a loss per share of $4.14 in the fourth quarter, and $0.09 in the first quarter of 2017, and beating out analyst expectations by an impressive $0.85. Gross profit margin was 30.5% for the quarter, while the company’s cash and marketable securities declined slightly from $3 billion at the end of 2017 to $2.9 billion due to an increase in capital spending for additional Series 6 capacity. First Solar barely modified its 2018 guidance, only shifting its Net Cash Balance down to between $2 billion and $2.2 billion, dropping its Operating Cash Flow down to between $0 and $100 million, and increasing its Capital Expenditures up to between $850 million to $950 million. It appears energy storage for a solar facility in Ohio is now being regarded as a fundamental operational consideration by participants. According to pv magazine, construction will begin in October on this Ohio 7 MW solar electricity storage facility. Completion of this project is expected some time next February. The facility, located in Minster, will be connected to a PV plant that is scheduled to go online by the end of the year. A basic consideration in any renewable energy network, the need to add storage has been called for by many solar proponents. The decision regarding this facility was made following the introduction of a bill that saw negative changes to Solar Renewable Energy Credit (SREC) requirements. When all is said and done, the solar+storage system is expected to be the biggest of its kind in the United States. American Renewable Energy and Power LLC (AREP) is the developer of both systems. The 7-megawatt energy storage facility will use lithium-ion batteries and will be adjacent to a new 4.2-MW solar power plant. Together, the two projects are expected to improve electric service for the Minster electric system, said Village Administrator Donald Harrod in an interview with Public Power Daily (PPD). S&C Electric Company was contracted by property owner Half Moon Ventures (HMV) to provide EPC services to the energy storage component of the project, which will comprise S&C’s PureWave Storage Management System. Work on this element should begin in mid-October and be completed by next February. AREP decided to expand the original solar project to include a storage facility, and received conditional approval from the Minster council in December 2014. After that, HMV was brought on board to provide financing for both projects; it is now the owner. The local electric utility views the addition of storage favorably, stated PPD, citing Harrod: “…the municipal electric utility had been thinking about spending $200,000 to put in capacitors to improve its power quality.” But with the solar and energy storage project, he believes the utility will be able to avoid that expense.